Our aim in this experiment is to investigate the environment of lead in PbO-Al2O3 glasses. Neutron diffraction has been performed on this system, and the Pb-O distance is 2.26 Å. The Pb-O peak however, exhibits asymmetry suggestive of longer bond lengths present in the glass. It is impossible to separate out this feature however, as it overlaps with the O-O peak at 2.9Å. The EXAFS experiment was carried out to give a better understanding of the lead oxygen bond lengths in this system. A preliminary analysis of the data shows two Pb-O distances in the glasses. 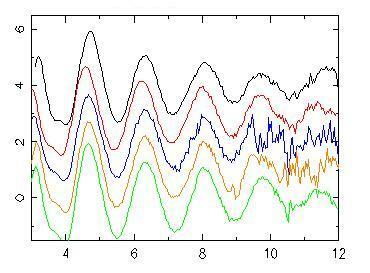 The first peak was fitted using the coordination number for the Pb-O peak obtained from neutron diffraction and the bond length was found to be ~ 2.22 Å. The second peak was at a distance of 2.7 Å, and the neutron data could not be used to help fit this peak because of the overlap with the O-O correlation function. Comparison with neutron scattering data, shows that a Pb-O distance of ~2.4 Å is seen in the neutron data, but not in the EXAFS. Analysis of the EXAFS data for the lead aluminate crystal phase also fails fit a Pb-O peak at this distance, as it is a small contribution in comparison with the other two peaks. The EXAFS investigation confirms the existence of at least two Pb-O bond lengths in lead aluminate glasses. The first distance is in good agreement with the Pb-O distance and coordination number extracted from the neutron data. 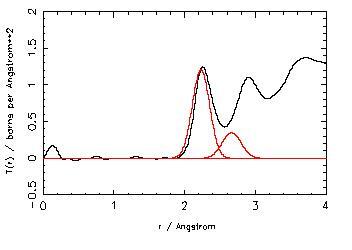 The second Pb-O peak is not resolved in the neutron data, as it is in the region of overlap with the O-O peak. This neutron diffraction experiment was to gather structural information on the stable, metastable and glassy phases of soduim tellurite compositions 0.1 Na2O - 0.9 TeO2 and 0.2 Na2O - 0.8 TeO2. There have been several structural studies conducted on this glass system because of the non linear optical properties associated with the lone pair of electrons on the tellurium atom. These studies have used a variety of techiniques, with the thermodynamically stable crystal structure as a model for the glass. This study is to investigate the metastable crystal phases which can be produced by heat treating the glasses. DTA traces have shown that, on heating these two glass compositions there are two crystallisation events. The high temperature event is the formation of the thermodynamically stable crystal phase and the lower temperature event is the metastable phase whose structure is more closely related to that of the glass. By carrying out neutron diffraction on the glasses, the metastable crystal phases, and the thermodynamically stable phases for these two compositions, a better insight into the glass structure will be obtained. The aim of this experiment was to study the role of lead in the glass structure, where it is capable of being incorporated at very high contents (> 80 mol.%). The upper glass forming limit has been reported to be between 90 - 95 mol.% PbO, and at these levels the lead cannot be incorporated as a modifier ion. In most aluminate glasses, aluminium is 4 co-ordinated, except at high Al content, where is has been found in 5 and 6 coordination. Conventional glass theory suggests that a glass network cannot form when the number of bridging oxygens per network forming cation drops below 1-2, for the PbO-Al2O3 glass system, this occurs at ~ 80% PbO. For glasses to form at compositions in excess of this, suggests that Pb is playing an important role in the glass network. The results of the neutron experiment have distinct Al-O peaks which are 4 coordinated and at a bond length of ~1.75 Å, as would be expected from studying similar aluminate glasses . The Pb-O peak however is assymmetric and overlaps strongly with the O-O peak. By fitting this assymmetry it can be calculated that the lead is 3 co-ordinated within a distance of 2.25 to 2.5 Å, with the majority of these bonds being nearer to 2.25 Å. Studies of the 69 mol.% lead aluminate crystal suggests that there are longer Pb-O bonds around 2.7 Å which cannot be measured from this experiment due to the overlap with the O-O peak. A EXAFS experiment is planned to extract more information on the Pb environment. This experiment was carried out to explore the change in symmetry of the Sn environment across the range of the borate anomaly. Previous work has shown that the tin environment changes dramatically from truly tetrahedral networks (silicate, germanate) to an asymmetric network such as phosphate. Preliminary analysis shows a feature at 2.1 Å appearing with relates to the Sn-O bond length, and a decrease in the peak at 3.6 Å which is associated with the boroxol ring.